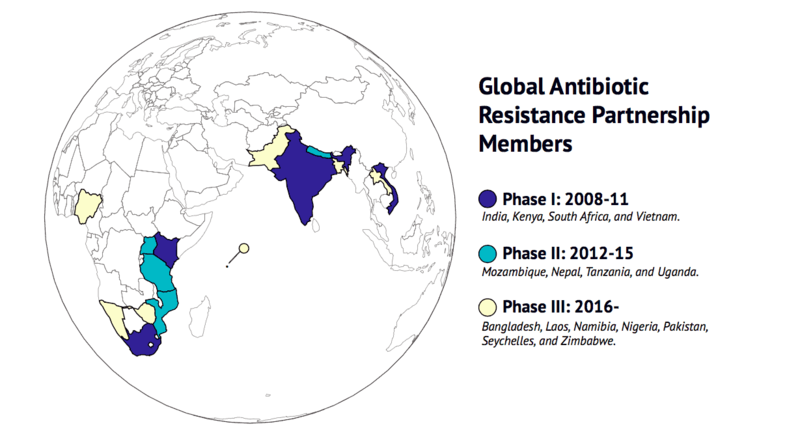 The Global Antibiotic Resistance Partnership (GARP) was started in 2009 to create a platform for developing actionable policy proposals on antibiotic resistance in low-income and middle-income countries. During the first three years, Phase 1 of GARP established national working groups in four countries: India, Kenya, South Africa, and Vietnam. The working groups multidisciplinary dealings with both human and animal antibiotic use have become national resources known for their expertise and linkages to the current global activities in antibiotic resistance. GARP Phase 1 culminated in the 1st Global Forum on Bacterial Infections: Balancing Treatment Access and Antibiotic Resistance on October 3-5, 2011, in New Delhi, India. Since GARP Phase 2 began in 2012, national working groups have been established in Mozambique, Nepal, Tanzania, and Uganda. The Global Antibiotic Resistance Partnership is supported by the Bill & Melinda Gates Foundation and an independent public policy grant from Merck & Co., Inc., Kenilworth, NJ, USA. Publications from "Global Antibiotic Resistance Partnership"
Graphics from "Global Antibiotic Resistance Partnership"